I made this recipe for the first time last year for Christmas, I loved it so much that I just had to make it again this year. It is a great cake for those who aren't that keen on fruit cake but would still keep fruit cake lovers happy too so is a great happy medium. It is rich and dark and sticky and gorgeous. It is ridiculously easy to make too. This year I made it in the small round paper cases again as these are a great size to give away as gifts. I also made use of some gorgeous cake cases I was given by the lovely Francesca, as well as putting some in some cute Christmas muffin cases. 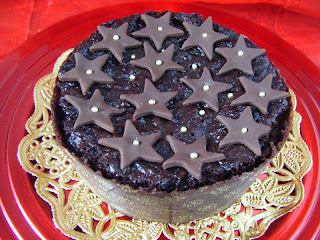 This year I got around to decorating the cakes- I found some chocolate fondant and gold cachous which did the job nicely. 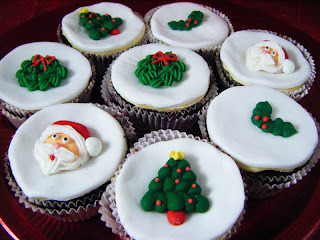 I also found some cute cake decorations to top the muffin sized ones, which I had put marzipan and white fondant on. It was great fun to make these, mainly because it was so easy!!!!! 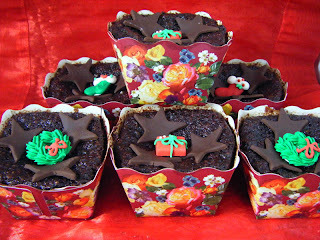 Wow Linda, how lovely to see my little cake cases filled with lovely cakes on the other side of the world! They look amazing, I wish I had thought of doing mini ones too. I made this cake for the first time this month. I was slightly dubious but OMG! 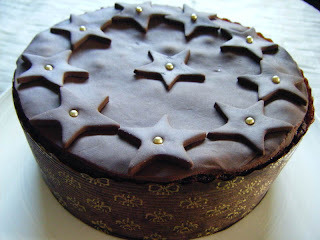 I love this cake, I adore normal Christmas cake but this was so moist and delicious I am so glad I tried it. I made this one for Christmas too, and seriously loved it. And I say this as someone who isn't much of a fruitcake fan. Yours, however, are sooooo much prettier than mine! Gorgeous decorations! Just adorable! I've not yet tried the cake, and I have never seen such pretty cases and decorations:) They look picture perfect Linda, your family and friends must have been doubly delighted! WOW Linda a little in commenting here but my word everything looks stunning! !